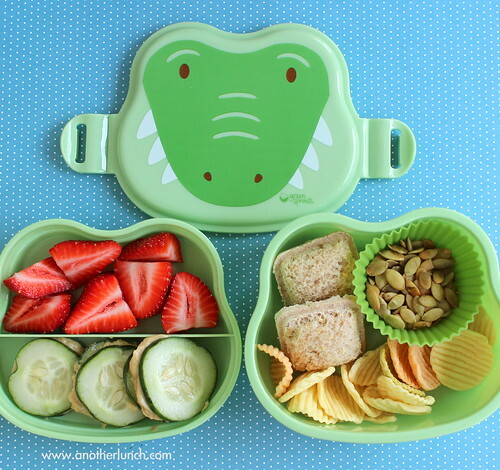 When I first posted about our new monkey bento box I mentioned I had really wanted the alligator. But I let Paige pick and she was very sure she preferred the monkey. And it turned out I really like the box a lot. But I kept thinking about that cute green gator. So, this happened. And today they both got all packed up with little lunches. Despite being on Spring break. And despite being trapped at home with sniffles, sneezes and other sickie sufferings. 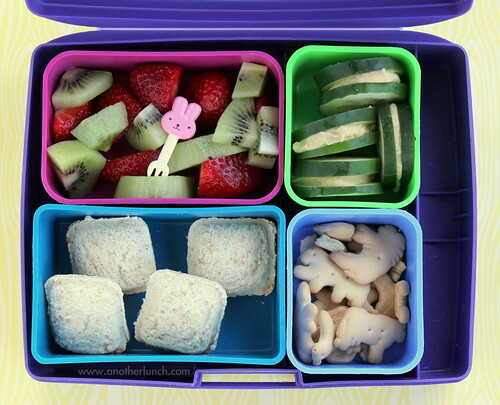 Bentos are fun at home too. I made Paige and Tyler almost the same exact lunch, with just a bit of a fruit switcheroo distinguishing one from the other. I thought it would be nice to put the red fruit in the green box, with green fruit in the red box. 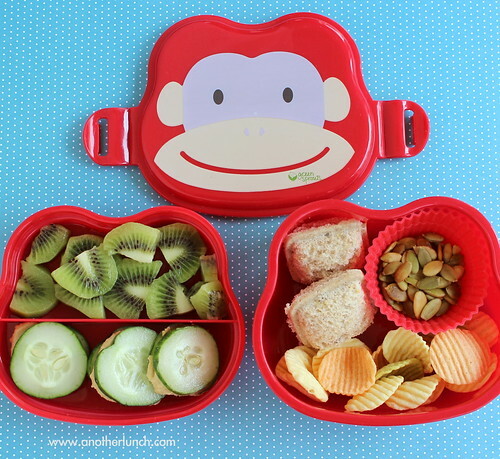 Paige's monkey bento was the same, but with kiwi fruit. And then when I gave them their little lunches Tyler said "I want kiwi too!" and Paige was all "where are my strawberries?" 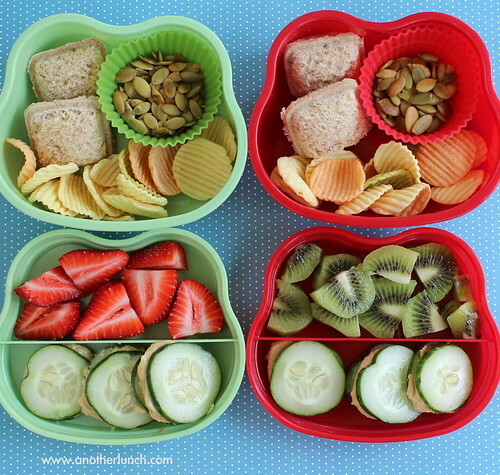 and so I grabbed a handful of each out of each bento and swapped, so the kids ended up having both fruits anyway. This week's theme for Muffin Tin Monday is "Spring is Sprung! ", a celebration of bunnies, chicks, eggs, and all those basket goodies. I'd love to see the muffin tins you have made this week! lunches packed in a hurry, part 2. 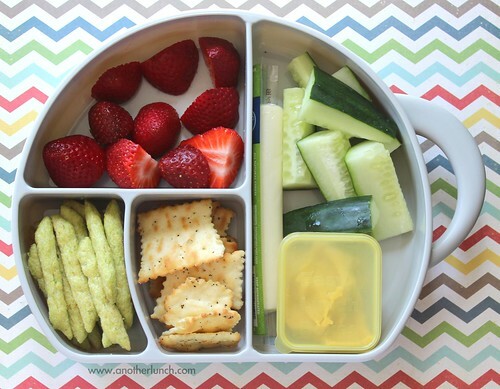 This lunch is packed in a Gerber Mealtime Organizer. A lunch for Tyler on the occasion that my husband and I took the three big kids to see Oz and this littlest tike went to a babysitter. Finally, a lunch of Paige's from earlier this week. Okay, looking at it now it doesn't look so bad. But I remember feeling panicked for time on this morning. We've had a second round of flu sweep through our house and Ethan has been out of school for a few days. 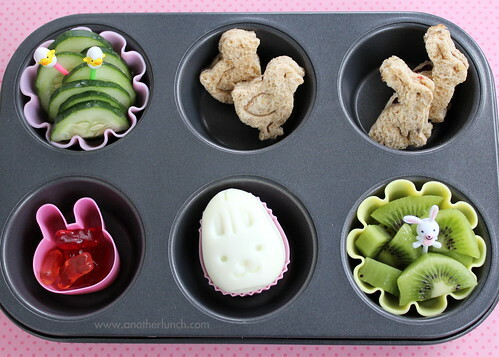 Less time for blogging and I'm getting a bit of bento backlog I need to post! 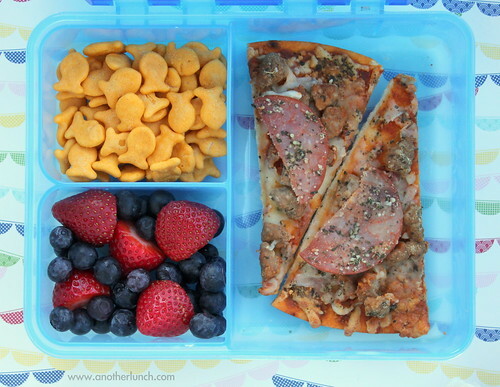 These two lunches are both Paige's and both feature new supplies I picked up recently. 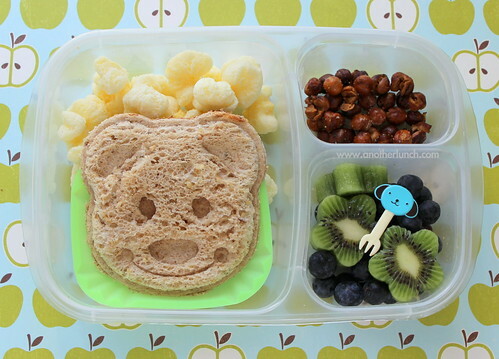 The bear face sandwich sealer is a one piece gizmo. You just make your sandwich and then press this into the sandwich. Press hard. And it's done. Very straight forward. It's important to make sure your sandwich fillings are not in the way of the edge though, and that part can be tricky. I was impressed with how well the face turned out. I think it could be even more clear with a smooth bread, but this bread is really seedy. The sandwich is in a large square silicone cup, mostly to keep it propped up so he didn't drown under the corn puffs. 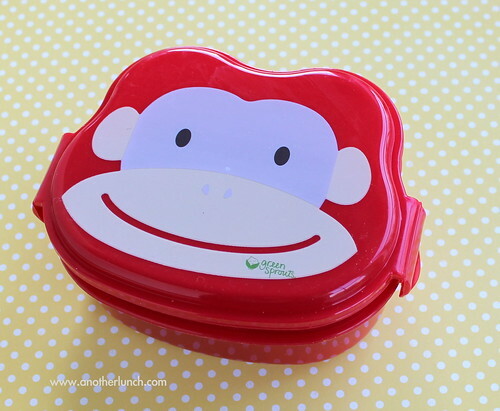 Another fun thing I got recently is this super cute monkey bento lunch box! I was instantly smitten. Truth be told, I really wanted the alligator, but Paige pleaded for the monkey. It's a little on the smallish side. The lid snaps on easily with two buckles that are easily snap open and closed. Inside there is a little shallow tray with a divider which lift out to access the deeper bottom portion. 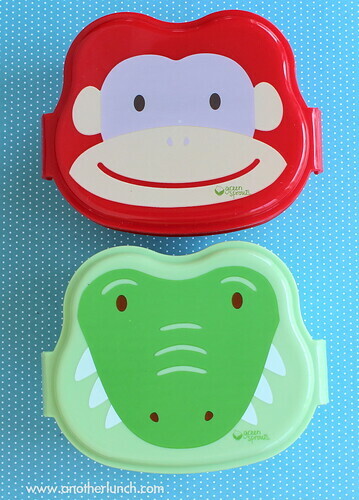 In the bottom portion of this monkey bento box there are two little sandwiches, cut and stamped with this cutter set to look like an elephant and lion. A standard sized silicone cup fits perfectly and holds roasted almonds. 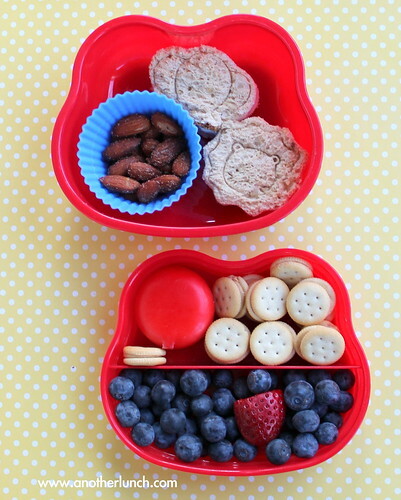 The top tray section contains a Babybell cheese, organic mini peanut butter sandwich crackers, blueberries and our last strawberry. I wasn't exactly sure this was enough food for Paige, so I included an organic yogurt cup along in her lunch bag. I like this box a lot. 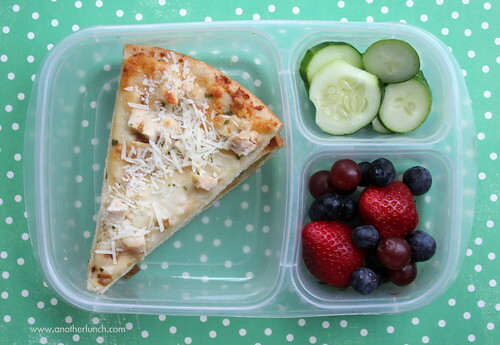 I think it's a really nice size for a preschooler's lunch, or any young child who is a light eater. 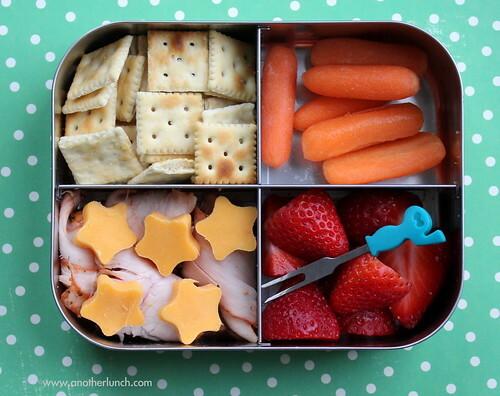 Paige is a robust eater and I suspect this cute box isn't going to be in rapid rotation for her school lunches, but will make a nice box for bigger snacks or on-the-go mini meal bentos (and I tend to make a lot of those on weekends and school breaks and summer vacation). Despite our best efforts we did not see, let alone catch!, any leprechauns yesterday. Tricky little buggers. 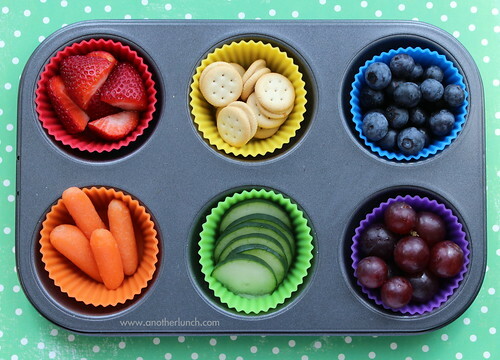 I went with a really simple, fast, and easy rainbow theme for our St. Patrick's Day muffin tin lunch. Strawberries, mini organic peanut butter & crackers (from Trader Joe's), blueberries, carrots, cucumbers, and grapes. The rainbow colored silicone cups are from a cute kid's cookbook I bought a couple years ago. Everything you might be wondering about Muffin Tin Monday, including the schedule for upcoming themes, is posted on the Muffin Tin Monday information page. 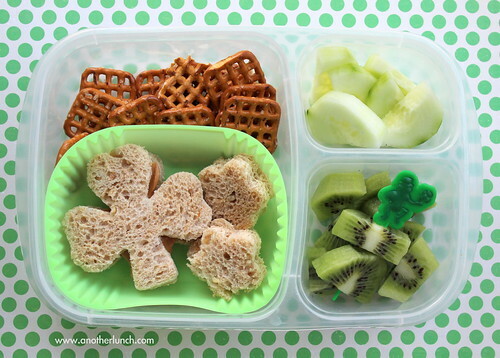 Paige's lunch today had a bit o' Irish flair today, with a little nod to St. Patrick's Day. I wasn't feeling particularly creative or motivated this morning, but it seemed necessary to do something. She has her leprechaun trap all ready to go to school and chatting up a storm about how exciting it will be to have her own leprechaun after it's caught. The sandwich is cut with a shamrock shaped cookie cutter. There was quite a lot of bread scrap leftover, so I made two little flower sandwiches from the leftover. I am still adjusting to the Daylight Savings fiasco and totally dragging in the mornings. This morning was the first day I've managed to snap a pic of a lunch before the kids left for school, and that pic is still trapped on the camera. But I've got a couple of stray lunch photos I haven't shared from recent weeks and here they are.